Crew Skill: Ground Vehicle Operations 4D, Vehicle Blasters 4D+2. Cargo Capacity: 1 metric ton! Cost: 7,000 Colonial Credits (new); 4,500 (used). Location: Top center of the chassis. Rate of Fire: Twin-linked beam per attack. 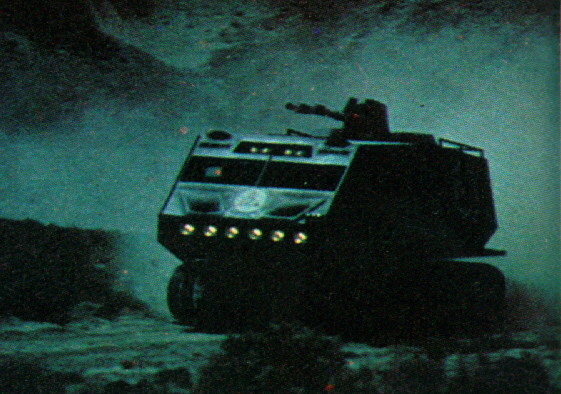 A landram is a tracked vehicle used for ground operations (Saga of a Star World), typically shuttled to a planet via a shuttle (The Gun on ice Planet Zero, Part I). It is capable of holding crew and cargo, and is equipped with a top mounted turret weapon. A landram was used for the initial scouting of Carillon. 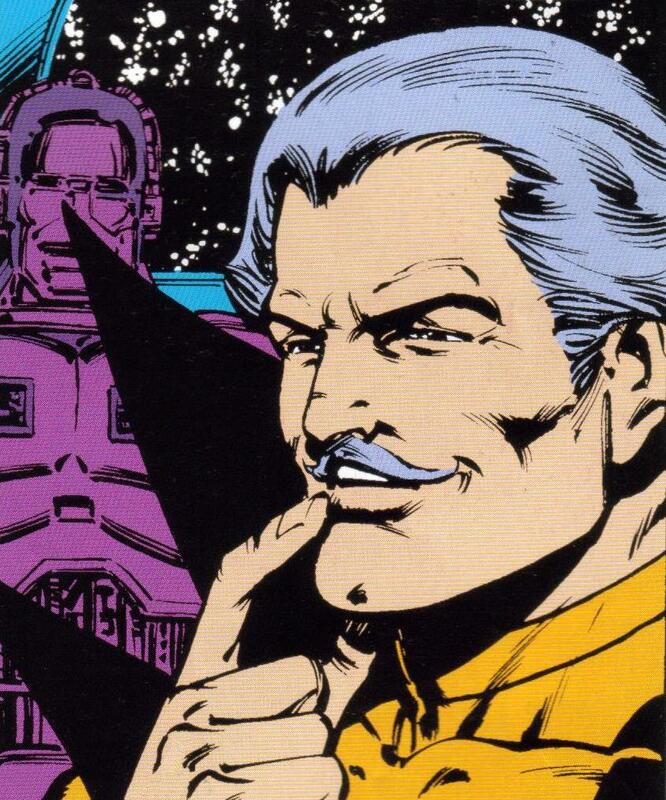 They were later used to evacuate civilians and warriors from the "pleasure resort" on the planet (Saga of a Star World). 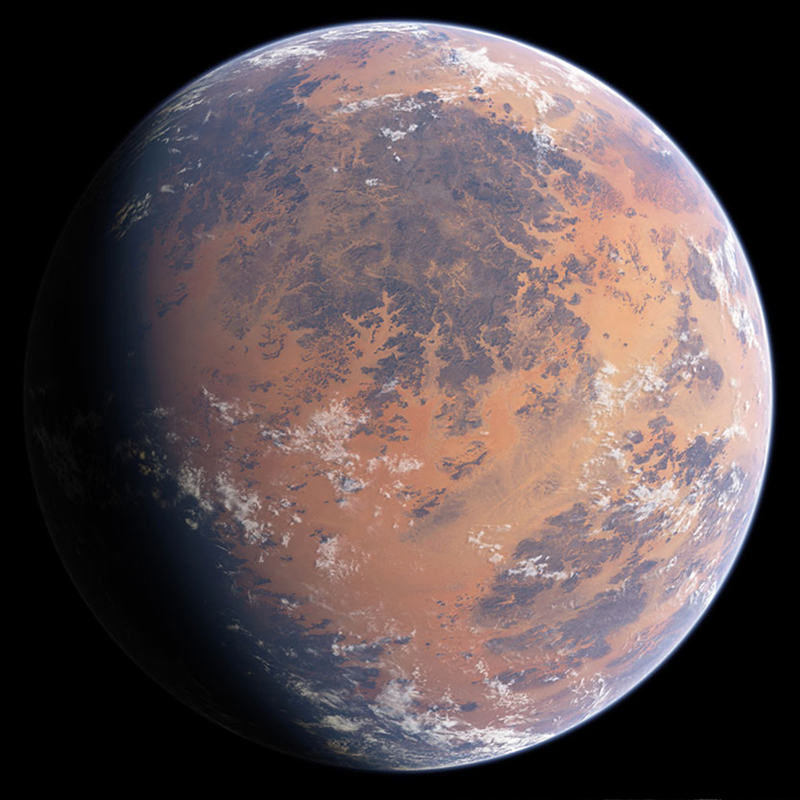 A landram is deployed to the surface of Kobol (Lost Planet of the Gods, Part II). A version of the landram modified for use in frigid climates is the snowram (The Gun on Ize Planet Zero, part I). Another modified version, this time without the cabin and open to the air, and presumably without Colonial markings, appears in "The Magnificent Warriors". It is stolen by agents of the Sheriff in Serenity. A landram is among the Original Series vehicles in the exhibition in Galactica's starboard hangar bay in the Miniseries. Included in the display are an original Viper, shuttle and Cylon Raider. 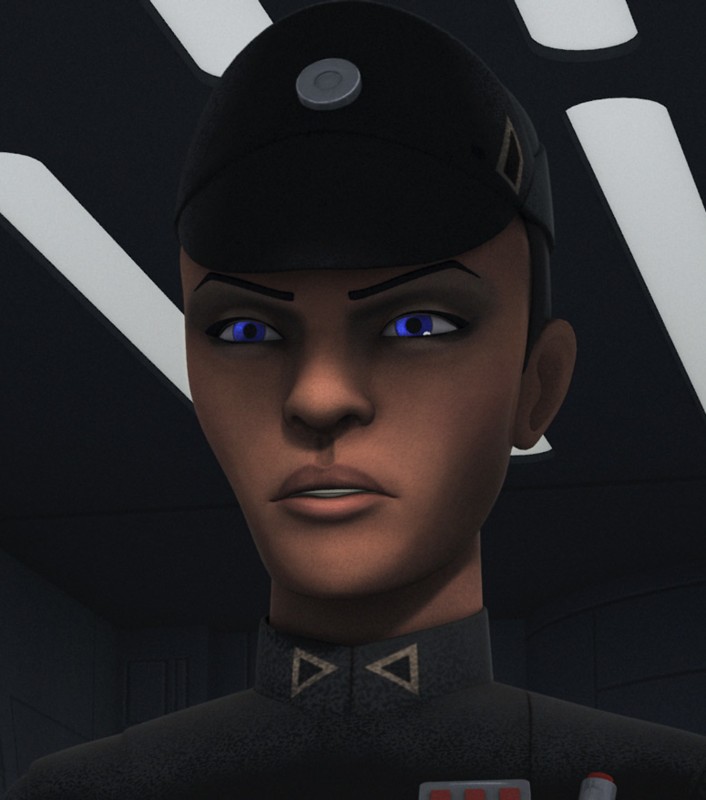 A landram also appears at the beginning of the episode "Scar", aiding the Majahual in mining activities on an asteroid. Another one is hit by a crash-landing Raptor in Galactica's landing bay (Escape Velocity).
? are these vehicle capable of operation in airless moons? If so then they could operate underwater. So are they? Hellstormer1: "Hi there. I wrote up the stats a while back, and based them on what I watched in the original series. They never showed the Landram in any such environment, but then the show's budget was limited. Given the advanced nature of Colonial tech, the need to battle Cylons in any environment (because they're machines), I'd say yes. It'd be kind of like military APC vehicles of today: they have enclosed controlled environments for air and temperature, and in some cases are even amphibious to an extent. The Landram could probably even be easily adaptable for mission-specific roles, adding gear, swapping weapons load-out, etc. You might even be able to add some kind of magnetic coupler device to make it attach to the outer hull of a capital starship! "Ultimately, it all depends on the imagination of the GM and players, so do whatever you like to fit your game and ideas." They could be adapted to mission specific or planet specific. I see a dome like the the dome turrets on the Y-Wing. The question is how many passenger can it carry? I don't think the Landram would carry 10-20, they aren's large enough to carry a platoon, I think 5-8 (total), they seem more like a squad carrier. The chassis is the same as that of the "Power Sled" (seen in the episode "The Magnificent Warriors") and it definitely seems smaller. Hi there. Sorry for the late reply, not as active as I used to be. Often when making stats for something new, I prefer to look at some stats for similar vehicles, if something similar exists in Star Wars D6. In this case, at a glance, I probably would have gone with the hover truck. I think that's in the Rebel Alliance sourcebook, but it's been so long since I looked, I am not certain. Also, sometimes I made stats for a vehicle or something closer to something else in real life (some of the Macross/Robotech stuff that really needs an update), so I'd look for a real life equivalent vehicle for comparison. In this case, while typing up this reply, I looked up "Bradley tank" and went to the wiki. All Bradleys seem to have a general crew of 3 (the Landram has 1 or 2, with 1 of these being a gunner, but in hindsight I would make it 2 or 3, with a skeleton crew of 1/+5, which would be more fitting I think). The Bradley M2 was the first variant I came across that mentions passenger capacity of any kind (most of the others seem to have less, or none at all), and it says it was able to carry and deploy a squad of 6 people. By comparison, the Bradley looks a littlw bulky on the outside, but I know for a fact that they're tight and cramped as heck on the inside. A full squad of 6 need to be very friendly to make it work, and there's a reason these vehicles have air conditioning on the interior, otherwise the smell in some war zones could become unbearable. The Landram, by comparison, is pretty big. It's exterior is a little bigger than the Bradley, but it's interior is much, MUCH more spacious. This would allow 10 passengers, easily, though it might still be a toght fit. Considering how many stormtroopers, or soldiers in general, fit inside capital ships like Star Destroyers, or walkers like AT'ATs, in Star Wars D6, the passenger capacity of 10 isn't bad at all, and I'd even go so far as to say 12, 15 if you include a full crew. Now that I am going through these steps and guesses, some of it is coming back to me. I thinnk I used the Bradley for comparisons on some other vehicles. And the "10-20" I want to say was either because I couldn't decide how many to make it and let the people interested figure it out, or because I was wondering how to describe something like "Emergency Evac Capacity". Some ship stats I have made actually list "Emergency Evac" along with crew, gunners, troops, passengers, etc. I stopped doing that because I was wanting to make up a house rule where emergency evac could be decided more on available cargo space (dump cargo, make room for people) and consumables (consumables last this long with normal crew, but if you have that crew x [number here], those consumables last this much less, but could be rationed, etc, etc). Anyways, back to my point, and to rap this up. Here's my opinion since this was my wrote-up. The Landram is bigger, both without and within, than the Bradley, so yes, it can carry 10 passengers. The walls and chassis of the Landram are a lot thinner than the Bradley, chalk this up to advanced technologies leading to much thinner armor, therefor even more space within so 12 is definitely doable. And finally, in an emergency evac situation, if everyone gets real friendly and sits on laps, yes, you could carry x2 the passenger capacity (20-24), but don't expect that to last very long, as this vehicle probably doesn't come standard with gear for long-term use out n the field as -is. That being said, one final note for conversions. If you'd like to take the Landram and convert it for other operations, much like the aforementioned Bradley tank has been with its variant models, this is pretty simple. First, take the passenger capacity and convert this to cargo space using the simple formula found in Galaxy Guide 6 Tramp Freighters (I always reference this for conversions). In the book, the conversion is 1 person = 10 metric tons. However, I have always been kind of "eh" about this, as when you look at maps of ships you can see crew quarters with multiple bunks per room (and maybe lockers or storage compartments for personal gear as well), and usually a shared head/bathroom. For single crew quarters, I usually double the cargo capacity trade-off (20 metric tons). In this case, keep it simple and cut it by half (5 metric tons). So, if converting all Landram passenger space for other mission uses, 12 passengers = 60 metric tons. This could be used for installing advanced sensory and weapons targeting equipment, ammo/missile magazines or energy batteries/generators for various weapons systems, full medical conversion for use as a war zone field ambulence, electronic warfare variant (for, you know, fighting machines with their own tech), and many other possibilities.